Definition at line 122 of file Esi.cc. Definition at line 1627 of file Esi.cc. Referenced by makeCacheable(), and makeUsable(). Definition at line 1622 of file Esi.cc. Definition at line 1822 of file Esi.cc. References attempt, except, exceptbuffer, flags, NULL, and parent. Definition at line 1657 of file Esi.cc. References attempt, DBG_IMPORTANT, debugs, except, and RefCount< C >::getRaw(). Definition at line 1693 of file Esi.cc. 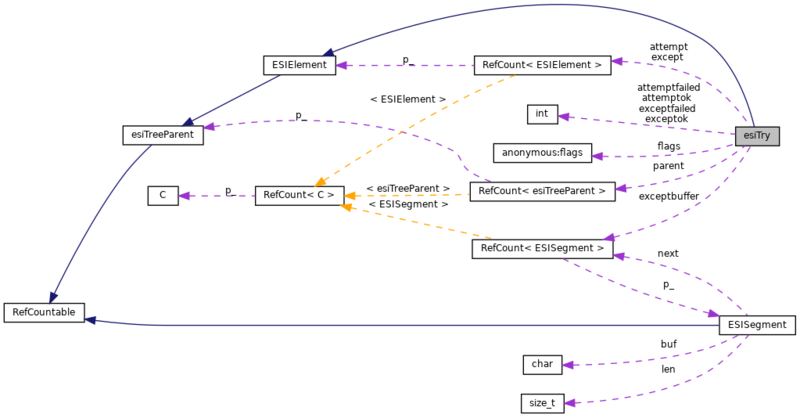 References ESI_PROCESS_COMPLETE, ESI_PROCESS_PENDING_MAYFAIL, and flags. Definition at line 1793 of file Esi.cc. References assert, attempt, debugs, except, flags, and notifyParent(). Definition at line 1869 of file Esi.cc. References attempt, except, ESIElement::finish(), RefCount< C >::getRaw(), NULL, and parent. Definition at line 1835 of file Esi.cc. References attempt, debugs, esiTry(), except, RefCount< C >::getRaw(), and ESIElement::makeCacheable(). Definition at line 1851 of file Esi.cc. References attempt, debugs, esiTry(), except, RefCount< C >::getRaw(), ESIElement::makeUsable(), and parent. Definition at line 77 of file Element.h. Definition at line 1778 of file Esi.cc. References except, exceptbuffer, esiTreeParent::fail(), flags, RefCount< C >::getRaw(), NULL, parent, and esiTreeParent::provideData(). Referenced by fail(), and provideData(). Definition at line 1702 of file Esi.cc. References attempt, bestAttemptRV(), DBG_CRITICAL, debugs, ESI_PROCESS_COMPLETE, ESI_PROCESS_FAILED, ESI_PROCESS_PENDING_MAYFAIL, ESI_PROCESS_PENDING_WONTFAIL, except, flags, RefCount< C >::getRaw(), and ESIElement::process(). Definition at line 1809 of file Esi.cc. References assert, attempt, except, exceptbuffer, flags, ESISegment::ListTransfer(), notifyParent(), NULL, parent, and esiTreeParent::provideData(). Definition at line 1635 of file Esi.cc. References assert, attempt, debugs, except, exceptbuffer, flags, RefCount< C >::getRaw(), ESISegment::ListTransfer(), and ESIElement::render(). Definition at line 138 of file Esi.cc. Referenced by addElement(), esiTry(), fail(), finish(), makeCacheable(), makeUsable(), process(), provideData(), and render(). Definition at line 144 of file Esi.cc. Definition at line 142 of file Esi.cc. Definition at line 139 of file Esi.cc. Referenced by addElement(), esiTry(), fail(), finish(), makeCacheable(), makeUsable(), notifyParent(), process(), provideData(), and render(). Definition at line 152 of file Esi.cc. Referenced by esiTry(), notifyParent(), provideData(), and render(). Definition at line 145 of file Esi.cc. Definition at line 143 of file Esi.cc. Referenced by bestAttemptRV(), esiTry(), fail(), notifyParent(), process(), provideData(), and render(). Definition at line 151 of file Esi.cc. Referenced by esiTry(), finish(), makeUsable(), notifyParent(), and provideData().